By turns historical, critical, and personal, this book examines the use of art--and love--as a resource amid the recent wave of shootings by American police of innocent black women and men. 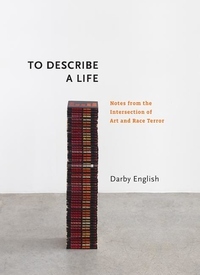 Darby English attends to a cluster of artworks created in or for our tumultuous present that address themes of racial violence and representation idiosyncratically, neither offering solutions nor accommodating shallow narratives about difference. In Zoe Leonard's Tipping Point, English sees an embodiment of love in the face of brutality; in Kerry James Marshall's untitled 2015 portrait of a black male police officer, a greatly fraught subject treated without apparent judgment; in Pope.L's Skin Set Drawings, a life project undertaken to challenge codified uses of difference, color, and language; and in a replica of the Lorraine Motel--the site of Martin Luther King, Jr.'s assassination in 1968--a monument to the unfinished business of the integrated nonviolent movement for civil rights. For English, the consideration of art is a paradigm of social life, because art is something we must share. Powerful, challenging, and timely, To Describe a Life is an invitation to rethink what life in ongoing crisis is and can be--and, indeed, to discover how art can help.